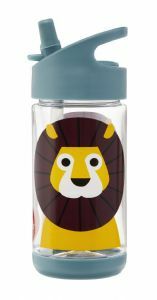 The 3 Sprouts Water Bottle is a must have for your child’s lunch bag. Made from Tritan, a high-quality plastic, each water bottle holds up to 354ml and is odour, stain and scratch resistant. The soft silicone drinking spout flips up and is easily accessible for younger children.